I’ve written this tribute nearly a week after David Bowie’s death. It’s only now that I’ve felt able to put my feelings into words. While his death was a shock, nothing prepared me for the shock of my own emotional response and the concealed depth of feeling I held for this man. Never before have I been so moved by the death of one of my heroes. The passing of creative heroes, such as Warhol, Lou Reed and Lennon, all resonated with sadness and reflection but I just moved on shortly after. Bowie, I now realise, is very different. Unlike Warhol and others, Bowie feels like a friend and creative mentor, complex but accessible. It has led me to experience the strange and untypical sensation of butterflies in the stomach and a feeling of loss. This was amplified by the fact that I’d been listening to his latest studio album, Blackstar, over the weekend of his death and felt I’d reconnected to his consciousness through his music, or so I thought. This was in itself unusual, as I hadn’t listened to any of his albums in their entirety since the early 80s. Experiencing his new album was a joyful event and came after reading glowing reviews in the media and the revelation that it was an ‘art rock’ record (as described in my iTunes genre category!). I decided now was the time to familiarise myself with his current creative state and must have listened to the album four or five times over the weekend, happy in the knowledge that he was back to his esoteric best and excited at the prospect of more to come. The weekend was spent reacquainting myself with the friend I’d never met and who, indeed, doesn’t even know I exist. Awaking to the news on Monday morning felt surreal. “Oh no! This can’t be true”. I kept saying. But he really had left us. He’d known he was dying for a while, but we were oblivious. On the way to work I listened to Blackstar again just hours after hearing the news of his death. It was like listening to the album afresh with a layer stripped away and, while it gives me the shivers, it now made sense. I’ve got nothing left to lose” (Lazarus). With skull designs upon my shoes.” (I Can’t Give Everything Away). It was obvious he was saying “goodbye” in his own inimitable and abstruse way. My adoption of Bowie as ‘friend’ and mentor started in the early 70s. 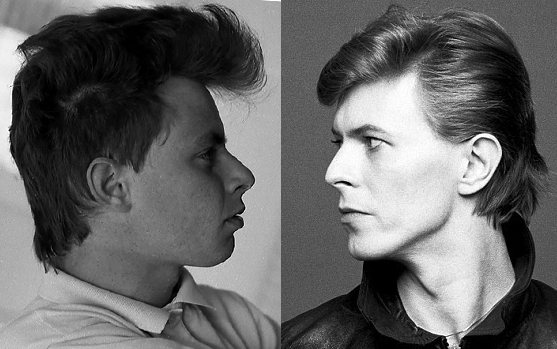 In many families around this time, Bowie caused a generational schism. But, unlike many teenagers at the time who recall their shock and joy (and parental disgust) at seeing an asexual ‘alien’ pop singer on TV for the first time, my first impression of his Ziggy persona was not one of surprise, but one of relief. Surely this is how all pop stars should look and act? In fact, looking at many of the glam rock stars of the time they seemed tame and unimaginative by comparison. He epitomised originality and creativity. No re-appropriating the teddy boy look with a bit of tinsel and some pink brothel creepers à la Mudd or the bovver boy glam of Slade or the brickies in glitter suits ‘chic’ of The Sweet. Even as a naïve teenager, living in a small, insular northern town, I could see Bowie was the ‘real thing’. As my teenage years progressed and my interest in music, art and design evolved it became clear that Bowie’s music was a rare thing, being both pop and avant-garde. I became more and more interested in the latter, although I loved his pop side too. His 70s albums were like evocative memory banks that track your life. The first album I heard of his was Ziggy. The songs were full of big ideas, drama and were panaceas for boredom, such as the apocalyptic glory of Five Years or the beautifully jumbled cut-ups lyrics of Moonage Daydream. Then I was introduced to his previous album, Hunky Dory, via my girlfriend’s sister’s post-hippy boyfriend. The songs were beautiful and delicate with beguiling and mystifying lyrics. Aladdin Sane, Pin-ups and Diamond Dogs followed gloriously, each revealing the delight and excitement of a new world of adventure. At school I’d dropped football to take drama, a brave decision at a 70s working-class school. Drama offered much more than football: a qualification, a chance to ‘interact’ with girls and a way to constructively act the fool. I’d recently seen the Yentob documentary ‘Cracked Actor’ and was mesmerised by Bowie’s mime and cut-up techniques. “What a multi-talented man”, I thought. I incorporated as much as I could remember into my final dance drama project (we didn’t have video recorders back then). In the late 70s I went to Art College where he was the omnipresent cultural and creative head of state – the darling of bedsit land and alternative culture – always ahead of the game. The three Berlin albums, the first two a deft mix of pop and experimental electronics, introduced the Germanic musical techniques of Kraftwerk, Faust, Neu! and Tangerine Dream. He also co-wrote with and masterminded the brilliant reinvention of Iggy, along with resurrecting the careers of Lou Reed and Mott the Hoople. I consider Scary Monsters (1980) to be his last truly great album of this period. For me, Bowie defined the 70s. As time has passed those albums have left a lasting legacy that have stood the test of time and the eight years from 1972 to 1980 indelibly stamped his music into my consciousness. By the Let’s Dance album my relationship with Bowie’s music was changing. I was shifting further away from pop and the mainstream. This album felt an unnatural continuation and companion to his previous work and at odds with my steadily acquired (and maybe snobbish and anti-commercial) art school sensibilities – the irony being that Bowie had contributed to this personal development. I had always believed Bowie shunned crass commerciality. But this album’s high sales had made him a more mainstream global artist. Indeed, many people who had previously thought he was ‘weird’ suddenly thought he was OK. This worried me too. The mainstream Bowie had arrived and the experimentation had gone. The music became less curious and it felt like his music had moved out of my field of interest. From this date forward, apart from some early 80s singles; I refrained from listening to or buying new Bowie releases. But Bowie still had a constant presence in my life. Whenever he spoke or was interviewed I knew I should pay attention and take note. All his 70s albums have had a permanent place on my digital music library and I made sure I saw the touring V&A David Bowie is… exhibition in Paris. Around 2005 Bowie seemed to disappear completely, retracting and pulling back even further into mystery. Then, over the last couple of years he released two albums in relatively quick succession. I dipped in to The Next Day album but felt as though an external force had compelled me to listen to Blackstar the weekend before his death. In the space of two days I boarded an emotional roller-coaster. First, the elation and expectation of further great Bowie albums in the future, then the unnerving feeling I had just been listening to someone describing their own demise. Bowie has been omnipresent in my life since the early 70s. He was a true creative and cultural innovator with an influential reach that spans decades. His creative output, be it music, fashion, style, art or comment equipped me with the ammunition to explore the world. He encouraged my curiosity and creativity and was the springboard for me to seek out new ideas and discover leftfield-orientated music, art, theatre, literature, technology… or whatever. No doubt over the next few years there will be a plethora of compilations, live albums remasters, remixes, rereleases, outtakes ‘lost tracks’ and books. But for me he was my brilliant ‘friend’ who I never met in person but who steered me through the wilderness of my teenage years. When he died I felt a part of my youth died with him. He’ll never know him how much he gave to me, and how much he has excited and influenced me. I’m going to miss him. Posted in Art, Fashion, Music and tagged Aladdin Sane, Blackstar, Cracked Actor, David Bowie, Diamond Dogs, Faust, Hunky Dory, I Can’t Give Everything Away, Iggy, Kraftwerk, Lazarus, Lou Reed, Mott the Hoople, Neu!, Pin-ups, Scary Monsters, Tangerine Dream, The Next Day, V&A David Bowie is…, Warhol, Yentob, Ziggy.